On average, a typical U.S. driver travels 13,476 miles per year. That’s 36 miles a day, which means there are a lot of people on the road that could be potential customers! Gone are the days when people lived, worked and played in a few square block radius. As America’s population has surged over the last 75 years, our nation has become more subdivided and our dependency on automobiles has increased. Consequently, car advertising has become a legitimate form of marketing. One that, if you are a local business looking to attract local customers, cannot be ignored. 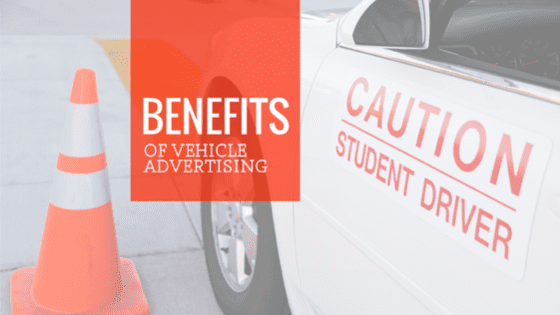 Let’s take a look at some of the benefits vehicle advertising can have. 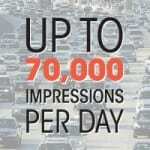 Lots and lots of impressions – According to the Outdoor Advertising Association of America, it is estimated that during an average day, a car advertisement can reach up to 70,000 impressions. That’s a lot of eyeballs! In fact, vehicle advertising reaches more people than billboards, radio, direct mail, local group mailers and mass transit advertising. But here is the best part – most individuals say that advertisements on vehicles are actually more noticeable, more memorable and caused them to take action quicker than traditional forms of advertising. Inexpensive – Like any good marketer, one cannot simply look at the amount of impressions a campaign might get and conclude that it is going to be successful or not. There are a lot of mediums out there where you can buy millions of impressions but it’s going to cost you a pretty penny when it is all said and done. So, let’s stack up car marketing costs to other advertising opportunities out there. When you break down the cost-per-thousand metric for each of the main advertising mediums, you can see that car advertising is clearly less expensive than it counterparts. Keep in mind, this is for a single advertisement. Even if you had a fleet of 5 or 10 vehicles, each with their own ads on them, at $.35 per thousand, it would still be $1850.00 cheaper than the next closest medium on the list. Tax write offs – Ok, before you start jumping up and down, thinking you can write off your whole car by slapping a decal with your business logo on it…..you can’t. Truth be told, auto deductions are highly scrutinized by the IRS and shouldn’t be taken lightly. A few years ago, it was ruled by a court of law that a business could not write off 100% of a vehicles expenses simply because of an advertisement. The good news is, any expense that goes into placing said advertisement can be written off. So, if you want to have an ad painted on your car, have your truck wrapped or just place a cool decal in your rear window, go for it. Just keep track of the expenses and write them off come tax time. It’s pretty clear that vehicle advertising – decals or magnets – is a great way for small and local businesses to market themselves. For little investment, you can turn your car or truck into a mobile billboard that reaches potential customers and causes them to take action. Besides, with advertisement on the side of your vehicle, you won’t mind being stuck in a few more traffic jams!